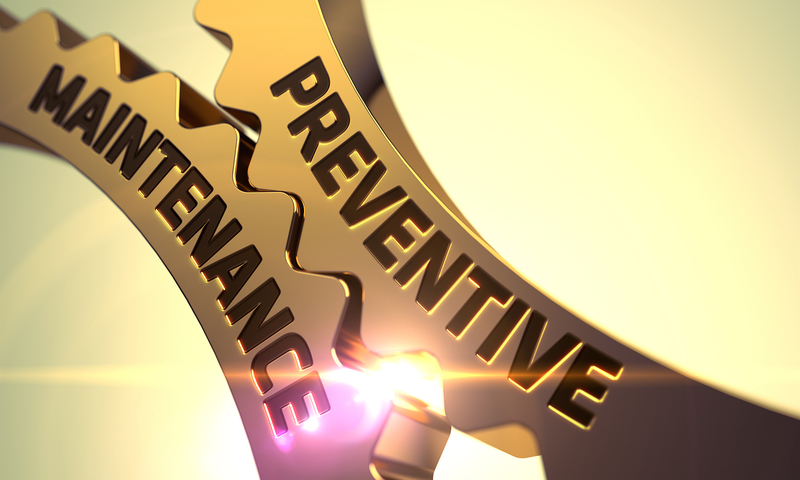 Preventive maintenance (PM) can avoid many problems…whether in a nuclear power plant, the home, your car…yourself. In the nuclear power plant, PM on pumps, valves, diesel generators, etc., increase safety and reliability of overall operation of the plant by minimizing component failure during operation. In your home, you most likely do things like change the furnace filter or sharpen the lawn mower blade, change the batteries in smoke detectors or clean the dryer vent of lint. Just like the nuclear power plant, you do these things to keep things in working order. On your car, I’m sure you change the oil and filter regularly as well as wind shield wipers or rotating your tires so that you are more likely to drive safely and with a lower incidence of accidents. So, how does PM apply to you? I’ll suggest a few ideas and then let you provide some of your own insights. Psalm 1 provides a good starting point – the blessings that come from a finely tuned Christian life…specifically, the choices we make in life are important. More importantly, your private life does have an influence on your public life. PM here is grounded in a lifestyle captivated by God’s truth both inwardly and outwardly. In keeping with this thought, is the message of Mark 12:28-34. Love…it’s a word I think is often abused and misused. The standard of loving God with everything I am, heart, soul, mind and strength is daunting. So many things in our lives compete with this simple, yet complex standard of living. And then, love my neighbor as myself brings to the surface a whole litany of issues. Issues like loving myself for starters – so many have trouble here. Then, what about loving that unlovable neighbor? What if we could really get this right? Can you imagine the possibilities? Is it possible to see ourselves, and the world, not as we are or as it is currently, but as it could be? Possibilities…with PM. I could come up with many more passages, however, I am hoping that you will join in with PM ideas of your own. The last one I’ll offer up has to do with our prayer lives and there are so many wonderful prayer passages: Philippians 4:6-7, 1 Thessalonians 5:17, Psalm 39. The passage I chose is Matthew 6:5-15. We say this prayer numerous times throughout the year but I would offer that it is critical to your individual daily PM. “Thy will be done”, “forgive us our debts (sins) as we forgive our debtors (those who sin against us)”…powerful words that are incredibly challenging. This passage begs us to think about our prayer life – not about how fancy our words can be or how many adjectives we can string together. This passage begs us to remember that God knows what we need before we ask…it begs us to listen to God – to determine his will for our lives and then live it out. PM from the One who wrote the owners manual on the subject and from the One who showed us what such a life could look like – Jesus. So, what do you think? How are you doing on your own PM plan? What are some of your PM ideas? A solid PM “plan”, when grounded in Jesus, will get each of us through the many problem areas life hands us as well as affording us the many joys that can only come from the many blessings our God affords. On November 19 our youth group, recently named Wildfire, welcomed our first live testimony–Jenni. You may have seen promotions for her on the slides at church, in the bulletin, or even on Facebook. She’s a bright and talented young woman who we were honored to host. Her testimony was especially beautiful because in an act of surrender Jenni sat in front of our kids and, with a vulnerable heart, told them how growing up she had always heard that God loved her but that truth did not register for a long time. Growing up I was like Jenni. I believed in God, I believed Jesus was His son who died for us, and I believed Jesus rose from the dead. I also believed God was an angry God who would toss me aside the moment I messed up. I remember being five years old and crying with my sister because the two of us were certain we were going to go to Hell. To be completely honest, I was terrified of God. Then a pastor came into my life who told me God hurt with me when I was pained and this reality changed everything. Do you know what it means when the psalmist writes about His steadfast love and how His faithfulness endures forever? It means that God’s grace and love is bigger than we can even imagine. It means that even in our hardest moments of life He is with us. It means when we turn our back and choose worldly things to satisfy our longings He is waiting for us to return to Him–even though we now carry extra baggage from the consequences of our sin. This all means God has not and will not give up on us (Philippians 1:6). This all means God will not forsake us (Deuteronomy 31:6). God’s love goes deeper and farther than our minds can comprehend (Ephesians 3:19). He looks at us with such admiration, like a father who looks on his beloved or a shepherd who keeps his sheep, and has forgotten our sins (Isaiah 43:25). To forget a sin proves a love deeper than I think we can comprehend. So long as we confess our sin to Him and ask for forgiveness (1 John 1:9) He will not only forgive, but will forget the sin and love on us in a way that could make me cry if I think about it longer than a minute. So, Praise the Lord, I say. For his steadfast love endures forever and forever. Thanksgiving is behind us! For many of us, Thanksgiving is about pausing for a few days and contemplate how God has been present in our lives over the years. For me, Thanksgiving is a constant reminder that God is always present even in those times when life seems to crumble or a new challenge opens the doors of our lives. It is not always easy to remember that, even more so to have a thankful heart as we experience those hard times. 1 Chronicles 16:34. Give thanks to the Lord, for he is good; his love endures forever; has to be one of those life verses for me because it does just that: reminds me that God is close. And if anything is a sure thing is that life will always bring changes, challenges, and new opportunities. In my devotional time for the past week, I had plenty of time to remember, reminisce and look from the other side to some of those times. It is easy now to point to a certain event in my life and say: God was there. I remembered the drive to the airport 15 years ago, with my parents in the car and the long goodbye, the uncertainty of what was ahead of me. And I remember that like it was yesterday. That anxiety of what’s ahead is something that creeps out from time to time. That anxiety is like a shadow that likes to follow around, and sometimes that anxiety can turn in to fear. Fear of the today, of the tomorrow, fear that will just eat away faith. But when anxiety and fear come around, at least for me, I find that it helps to remember who God is, and remember those times when his light, his peace dissipates the darkness that creeps in. Psalm 94:19 When anxiety was great within me, your consolation brought me joy – for me goes hand in hand with thankfulness, because when we remember who God is who can also find comfort. Comfort and peace that we all need from time to time. Today I pray that each one of us can experience that comfort, that peace that is promised to each one that puts their faith in God. In this passage, we have three men who have served the Lord well: Paul, Timothy, and Epaphroditus. At this point in the early church history, Paul is imprisoned, and therefore relying more heavily on his own disciples. And, according to Paul, Timothy and Epaphroditus are two of his very best. Timothy was said to be from Lystra, a town located in present-day Turkey. It was in this town where Paul and Timothy met during each of his first two missionary trips. Timothy, and really the whole town of Lystra, were in a peculiar situation of being once part of a Greek province, then under the rule of Rome, but also consisting of people who were of Jewish faith. So, Timothy, as a result, was the son of a Greek man and a Jewish woman. The town itself did not have a synagogue, but did have Greek temples. After witnessing a healing of a lame man (Acts 14), it is likely that Timothy converted to The Way (early term for Christians). In his second mission trip through Lystra, Timothy was ordained as one of Paul’s disciples. Epaphroditus was another follower and disciple of Paul, and who resided in Philippi. Paul refers to him as his as a brother, co-worker, and soldier. In this case, the word used to describe brother is one of close, personal relationship. Paul obviously deeply cared for and loved Epaphroditus. The use of co-worker refers to Epaphroditus’ commitment to his service to Paul and to Jesus. Finally, the word soldier here refers to someone who has endured hardship in his service. In these two people Paul refers to, we have two people who have served the Lord faithfully and have worked their fingers to the bone. Paul says that there is no one else like Timothy, who has served and will serve genuinely FOR OTHERS rather than himself, as it appears others serving in Philippi have been doing. Epaphroditus served so well to the point that he was ill and near death. Just as Paul, Timothy, and Epaphroditus did, we are called to serve Jesus faithfully. We are called to be “all in.” When the time presents itself for us to do service in the name of the Lord, whether it is to hold the door open for someone, to allow someone to merge into traffic on the road, or shovel snow for someone who is unable, or whatever the case may be, that we do that job 100%. It is my belief that we will do better to spread the love of God through service of others than we would by any other means. Pay it forward. You may be surprised at the result. Leprosy is a contagious disease, that renders the afflicted with joint pain, lethargy, and loss of feeling in their extremities. According to the Law of Moses they are to be inspected by the priests and quarantined, for health reasons, and live their lives separated from the rest of family and society. It’s a lonely life and rather hard living only in the company of other lepers. The Law also states that if cleansing comes the affected one is to show himself to the priests for a specific ritual for ceremonial cleansing. Very simply my question to you is, do you think for a moment that the other nine were not glad and thankful for being cleansed? I am sure they were, they had to be ecstatic, their lives were about to turn around from misery to normal. they could be reunited with family and friends, get jobs, support their households, and touch and be touched again. I can’t imagine any one being so removed and callous as to not be grateful for this miraculous healing, and I doubt they were either. But, they didn’t say anything to Jesus, their healer. In their hearts they may have been thankful, but their mouths were silent. An unspoken word of thanks will never be mistaken for ingratitude. So very simply let us not be like these nine men. Rather let us be like the one, who did not hesitate to return to Jesus, who did not resist saying thanks. Whether it be to God, or to each other, even to spouses, children, parents, friends, or even pastors, let’s open up and say what we are thankful for. I had to confess to my wife that I was most thankful for her for doing the laundry. In my opinion it is a most vile chore and she so religiously does it. I wear the clothes, throw them into the hamper and they magically end up clean and in the closet. Its a miracle, thanks Becca. Review: Israel’s travails are ending (vv. 1,2)…An unknown voice announces superhuman work is to be done for YHWH’s entrance (vv. 3-5)…God’s Word proceeds His coming (vv. 6-8)…Upon arrival, He is presented as a caring shepherd (vv. 9-11)…What follows amounts to God’s defense of Himself (vv. 12-26) to a questioning Israel (v. 27)…Isaiah invites Israel to think on what God has displayed by way of creation and His mercy (vv. 28-34), reminding them that He does not tire of laboring on their behalf. Analysis: This section of Isaiah, which runs from 40:1 to 56:8 reads as if Israel is captive and awaiting deliverance…Because of this, it has been alleged that another author, possibly with the same name?, wrote it as it’s literary style and theological viewpoints differ from what precedes it…Regarding hard evidence to support this view, these are really only two pieces 1.) Cyrus, the Persian leader of Israel’s conqueror’s Babylon, is mentioned (45:1) a century before his time & 2.) Israel’s captivity is assumed rather than predicted…The first is easily answered if one believes in predictive prophecy…As to the second, the northern tribes of Israel were captured by Babylon during Isaiah’s lifetime… Judah’s continued sin and reckless living made it clear to Isaiah that is was simply a matter of time before they met the same Babylonian fate…Given these circumstances, it isn’t too much of a stretch to imagine the Spirit of God urging Isaiah to write something to encourage the faith of the godly during their upcoming dark days of captivity in Babylon…The passage (vv. 3-5) is echoed by John the Baptist (Matt. 3:1-3)…Also in the NT, “…you who bring good tidings,” (v. 9) is spoken of in conjunction with the spreading of the Gospel (e.g. Luke 1:19, 8:1, Acts 8:4, 10:36, Rom. 1:15, 1 Cor. 15:2, etc. ), evangelism that is…On To Christmas! This Sunday is the Reign of Christ Sunday for the church. It is the Sunday before Advent. 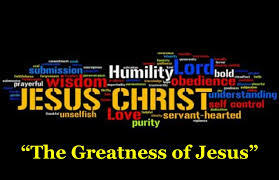 It’s an opportunity to acknowledge the amazing, life altering, awesome Lordship of Jesus over all things and everyone. I chose three passages for they speak to us of the supremacy, wonder, power, and extravagant love of the Lord Jesus. I encourage you to read these passages on this Thanksgiving Day that you might pause and give thanks for Jesus, our Lord and Savior. Know that you are deeply loved by the Lord Jesus Christ. 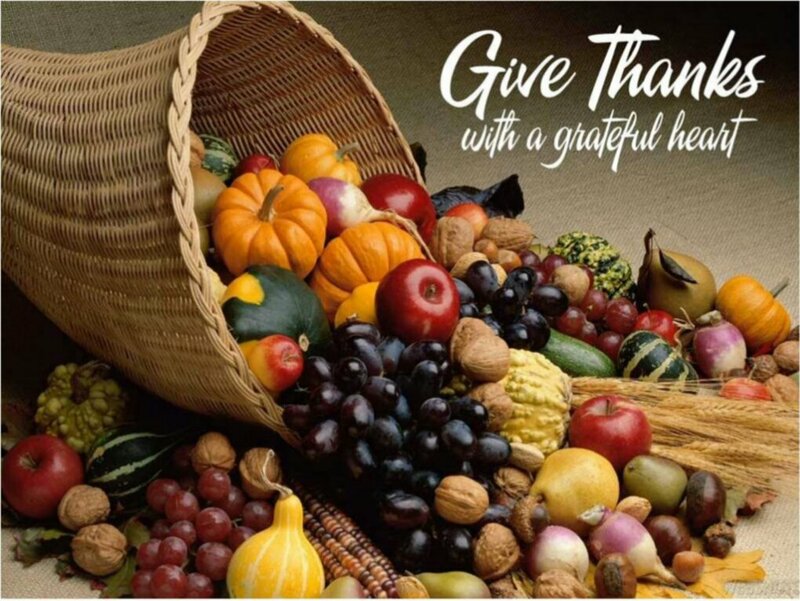 Give thanks! What are you thankful for? It seems to be more of a cliche than a real question. How many times are you asked this question? How many times do you ask this question of others? When you really think about it…I mean, really think about it, what are you thankful for? We’ve become a culture of one or two word answers…stringing words together to form a sentence with a cogent thought is becoming a relic. So…I’ll give it a whirl. I am thankful for family – both organic and adopted. My family has dwindled over the years. Mom and dad on both sides have been gone a long time. Tari is my rock – 35+ years together and a strength in my life beyond compare. Brian and Kelly live in Ohio and while it seems close, at the holidays, it can be a long, long way away. Lisa lives an hour away and she, too, has her own life in full gear. Lisa will be here with Tari and I for Thanksgiving – it will be a joy. Karen, my sister, is now in Arizona starting a new life there. And yes, there are a few cousins left, but they are distant at best. My organic family has shrunk dramatically. Then there is adopted family…Craig, Karissa, Bo, Diane, Tracy, Sherry, Jen, Ken and my new friends at The Center, Kelly, Rick, Wayne and so many more – individuals I work with nearly every day along with my church family (too many names to mention). I am thankful for family!! It may sound simplistic but know it is an awesome statement. Beyond family, I am thankful for the abundance God has placed in my life. The many gifts he presents each and every day – opportunities to make a difference in this world. We can try to look in our rear view mirrors and hope and, yes, even pray for “the good old days” but I don’t believe this is what the Creator of the universe has in mind for us. I believe our God desires us to greet him with thanksgiving in the morning and again when we lay our heads down on our pillows at night. All of this has had me thinking about a question I was asked on Monday about my favorite verse. When I think about “favorite verse”, I think about my life verses…verses from the Bible that have significant meaning in my life. Verses that provide direction and guidance each day. Having just one is difficult: Colossians 3:17, Proverbs 3:5-6, Romans 1:16-17….all good ones and, over many years, each has provided life insights. With over 31,000 verses in our Bible though, the one that is most significant for me is Joshua 1:9, “Have I not commanded you? Be strong and courageous. Do not be afraid; do not be discouraged,for the Lord your God will be with you wherever you go.” This verse is a constant reminder to me about my focus regarding thanksgiving…our God is with us wherever we go…do you believe this? I have been beyond blessed to have strong Christians in my life: the youth advisor who gave me hope at thirteen, a mentor who loved me as I was when I was at my lowest, a woman who took me into her home as family, a mother who humbles herself before the Lord to sing His redemptive praises, a leader who encouraged me to lead my own group, and more still who show grace, love, and compassion. Without these people I would not be me. Without them, to be completely honest, I probably wouldn’t know Jesus. That being said, I may not always like what they had to say. Paul talks about how we need to hold those who admonish us in the highest respect. Do you know what admonish means? To warn against or reprimand someone firmly. I can’t think of a single person who enjoys that being done to them. However, it is important to have these people in our lives. I need the people who love me enough to call me out when I am flirting with sin because, I don’t know about you, but what I want to do is not always the right thing nor is it good. Thank God I have people in my life who recognize this and remind me that whatever instant relief I may feel from sin it is not worth the long-term turmoil. I need someone to warn me when they see me going wayward–whether it is in music, television, or actions. Who in your life is keeping you accountable? Who in your life is brave enough to call you out on your garbage? Whoever that person is, love on them today. Thank them for their continual service to your growth and well being. Doing what is right, good, noble, and helpful is far from easy. Then, turn around and be that person for someone else. With gentleness and in love point out a harmful pattern or habit in someone’s life. Remember, this is not about being better than anyone, this is about being Christ’s disciple. Jesus came to Earth so that we would be right with God. No longer do we need a priest or religious man to do the reconciliation and sacrifice for us–we can be the hands and feet of Jesus as soon as we accept Him as our Lord and Savior! Show Christ’s love to someone you know by pointing out what is good and encouraging them as a brother or sister thereafter. I want to thank the women in my life who have shown me what it means to be a Godly woman. These women have gone from teacher to friend in a beautiful cycle. I want to thank the Christian men who have stepped up to be Godly examples when my family lacked them. I am loved and held accountable by people who wish to see my thrive. I am a grateful girl.